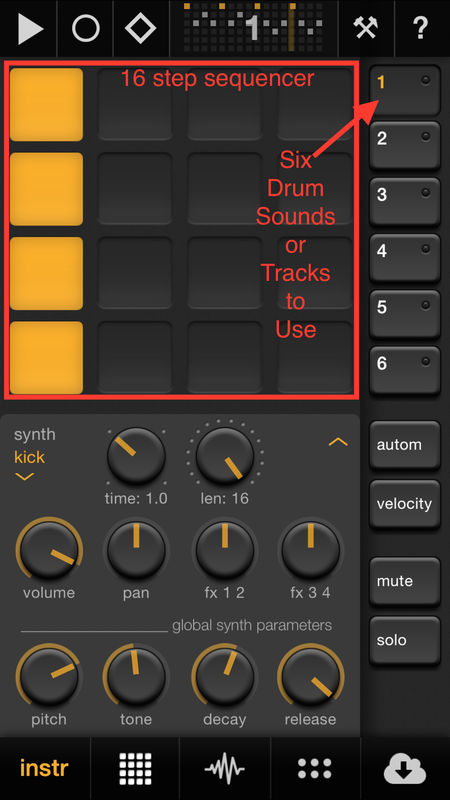 If you are looking for a new and exciting way to create some interesting drum tracks there is a new app on the scene these days that gives you a slew of options. Elastic Drums, from Oliver Greschke, was released the middle of December. I’ve been playing with it since then and am pretty impressed by what this app offers and the ways that it allows you to work. It’s not perfect and it’s not for everyone but Oliver is hard at work to make improvements. In fact there has already been one update released! One of the lines in the app store description states, “The sound range is from analog “oldschool” beatbox to the weirdest effect drone soundscapes.” Another way to read this that Elastic Drums isn’t going to give you an acoustic drum set sound track for your latest Jazz arrangement! 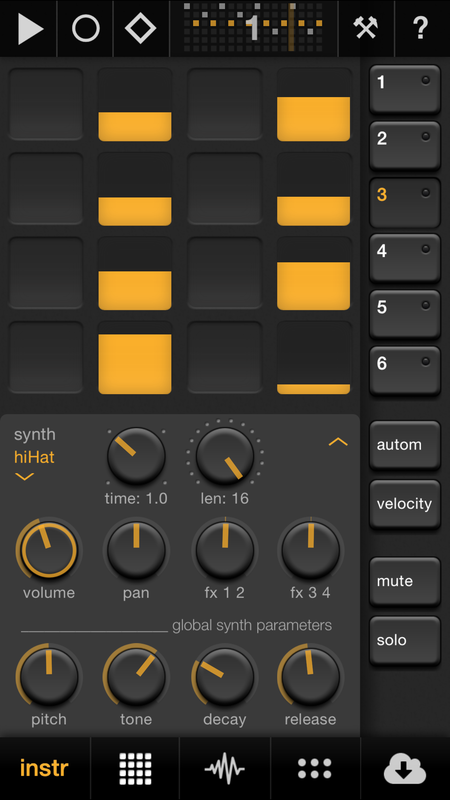 The sounds built into this app are synthesized, no samples here folks. The benefit to this is that Oliver has been able to give us new options. That is what this app is all about, working in new ways. On the left you see the opening screen once you get into Elastic Drums. It is pretty straight forward for anyone who has worked with drum machines before. In the middle of the top is an overview of what is in your pattern along with a number so you know which pattern you are working with. Below that is the 16 step sequencer section – tap a box and a sound plays. Simple enough. Below that is where the fun starts to happen – If the time knob is set to 1 and the length knob is set to 16 then all is as expected BUT this is called Elastic Drums for good reason! You can use the time option to have this instrument time set to 0.5, 1.0. 2.0, 4.0 – this allows you greater flexibility because this is a setting per sound. So your Bass drum could be set at 1 and your hi-hat could be at 0.5. Of course the volume and pan knobs are pretty simple. The FX knobs allows you to send each instrument to 2 out of the 4 effects available for your tweaking fun! If you want FX 1 then turn the knob counter clockwise. If you want FX 2 then turn the knob clockwise. The bottom four knobs start to give you an even deeper sense of how easy it is to tweak things in this app. Having those knobs right at the top level is a great concept as usually you have to dig down into the settings to find these options! The concept is simple to get you going – if you tap the cloud button at the bottom there are a bunch of examples so you can get a sense of what is possible after doing a little tweaking and setting things up. It is also important to note that there is a blank setup for you to access in there too! Tap on the _init-preset, then everything will be set to 0 and you will be able to start building your own rhythm track for the next chart topper! You can build from there by tapping on the buttons on the right to build up to 6 different instruments. It is important to note here that for some reason in is init-preset that instruments 5 and 6 are muted in the mixer. To fix that simply tap the 6 little dots next to the cloud and turn the mute off for those two tracks. After you get some drums playing then it is fun to start playing with the automation – tap that autom button and start turning knobs – everything you turn will be recorded and will then play back! It’s really fun to have the track jump back and forth between two FX’s, or to adjust the pitch up and down along with the tone. 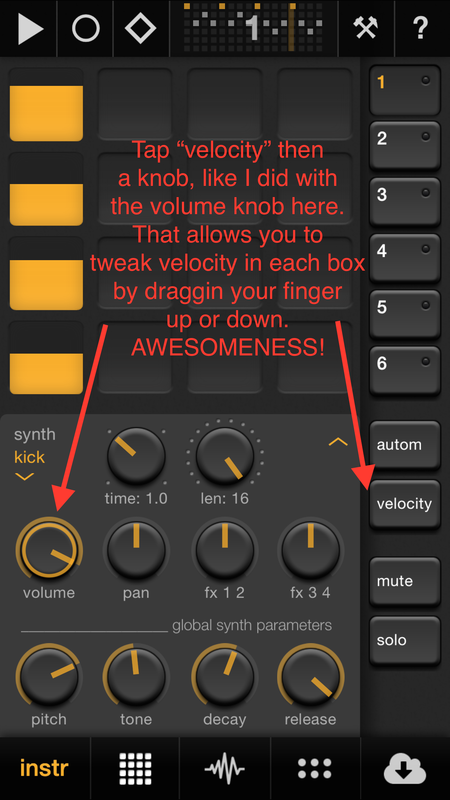 Heck – make ALL the knobs automated! Go for it! In fact… tap that little up arrow just to the side of the autom button and you will get a whole bunch more parameters to mess with! The velocity knob gave me a fit for a bit though – I will admit that! Step 1)Tap the Velocity button (after which you will get a pop up dialog that explains the process a bit but that pop up goes away too soon even for me and I consider myself a pretty quick learner as far as tech goes! Step 2)Tap a second knob such as the volume knob, like I did to the left here. Step 3)Then you will see that each box in the step sequencer has adjustable velocities! This is SO important! This allows for your sequence to sound a bit more realistic like a real person would play it! With some beats being louder and some softer. Step 4)Simply drag up and down on each yellow box in the sequencer to adjust the level for that step! Step 5)Sit back and watch the velocity knob automate itself and jump up and down as you have told it to! At the bottom of the screen you will see the button with 16 steps on it (the second from the left) this is where you go to set up different patterns. Inside this screen you will also see the option to play all those patterns in song mode. This app is one of the many that are appearing now that is taking advantage of the greater processing available on the newer iOS devices! This is one of those reasons I don’t suggest getting iPad2 or iPad3 anymore! Focus on iPad Air or the newest iPadMini. Of course the iPhone6’s are awesome as well. This app will allow you to jump right in and start creating right away but it also has SO much to it that you will continually find more ways to manipulate your drum tracks as time goes by! Amazing flexibility and outstanding options that are easy to find and tweak! 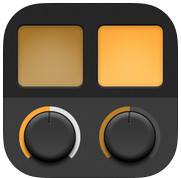 Your drum tracks have NO EXCUSE to sound static and boring when created with this app! As much fun as I am going to have with the sounds in this app I would love to see more traditional sounding options as well – Much of the music I do is going to require that actually. Although simple AudioBus functionality is built-in and app like this is crying for Inter-App-Audio! The good news is that Oliver is working on it! Of course since we are talking about drum tracks another much needed feature is the ability to sync tempo, start/stop with other apps. Currently, when you are done playing with this app, it would be a really, really, really good idea to force quite it as it will still drain your battery pretty heavily! Double tap that home button and drag the app out of the tray. Soon a switch will be integrated into the app to allow shutting off of the background audio. WretchUP $3.99 – If you are looking for apps to help explore the wild side of music tech and manipulation of sound then Oliver’s other app WretchUp just might be your cup of tea! The title says it all. Take any sound input and WretchIt Up! Wild, sonic mayhem, that will give you unexpected crazy results. Want to see it in action? Search Mouse on Mars’ on YouTube plus WretchUp and you will quickly get a sense of what is possible here with WretchUp! I made a video! I know, I know, you can hardly wait! Check it out here on YouTube to get a sense of what is possible with Elastic Drums….